If you don't see the video (it's usually included near the bottom of the email, please go to the original blog article to view it. Sorry for the inconvenience. I hope you'll watch it. I spent days editing it! We have a big cinnamon tree that we planted about 9 years ago. It was about 12 inches tall (30 cm) and cost around a dollar when we planted it. Cinnamomom zeylanicum (Ceylon cinnamon or true cinnamon) is a beautiful shade tree with small, dark, glossy leaves. It blooms once a year with white flower clusters, followed by small, acorn-shaped 'berries' (terrible tasting – don't try them!). Tender new growth sometimes has a pinkish hue. Even if you aren't interested in harvesting the spice, I highly recommend this attractive tree as an ornamental shade tree in your tropical garden. CURLA (north coast Honduran agricultural university) recommends that it be grown below 500 meters altitude, though it can be grown up to 1,000 meters (3,200 feet). Cinnamon trees can grow to 10-15 meters in height (~30-45 feet). Cinnamon needs to be grown in tropical climates where temperatures are mostly in the 27-30°C (80°-86°F) range and the rainfall is heavy, 1,500-4,500 mm per year (~60-180 inches). It does not like prolonged dry periods. Be careful where you purchase the tree, though, as my CURLA tropical fruit book mentions that the trees grown from seed in the Lancetilla botanical garden are subject to fungal problems. CURLA propagates from cuttings of a Puerto Rican variety which doesn't have problems with fungus or insects on the north coast. We've trimmed the tree several times to remove low hanging branches and to try to correct its lopsidedness. This was caused by dog damage, overcrowding, and rainy season neglect when it was young. The tree generally has a very nice shape which doesn't require much, if any, pruning. Trimming emits the most wonderful smell of cinnamon (canela in Spanish), as does crunching up a leaf. I always wanted to harvest the cinnamon but didn't know how. (We didn't have internet for several years.) This time I searched until I found some information that made it clearer how it was done so we decided to give it a go. On cinnamon plantations, I've read that they allow the young tree to grow for 3-6 years until it is 2-3 meters tall (~6-10 feet) and then cut it back a few inches above the ground. This allows multiple new stems to shoot up. The cinnamon can be harvested from this first cutting. The new stems are allowed to grow for 2-3 more years and then the cinnamon is harvested by cutting the stems almost to the ground again. In this manner, the individual plantings can be kept going for many years. There is the added benefit of having long, straight, mostly branchless stems from which to harvest the cinnamon. I may try that with some of the many seedlings that pop up under the tree every year. The best time for harvesting cinnamon is right after the rainy season, but not while the ground is saturated. Unfortunately, we trimmed this tree right before the rainy season, so we soaked the wood overnight. This supposedly is to make the bark easier to remove, though we aren't sure if it made much difference. I'll skip this step next time unless the bark proves hard to remove. The recommended sizes for harvesting the cinnamon are branches or stems with diameters from 1.2 to 5 cm (about 1/2 to 2 inches). Smaller diameter branches don't have a thick enough layer of cinnamon and larger branches are used for making cinnamon oil because the cinnamon will be bitter. First, any leaves and small twiggy branches shooting off the branch that you are going to use should be removed. Unless you are a pro, you'll probably want to cut the branch into shorter, easier to handle pieces. Around 60 cm (24 inches) worked well for us. Then the dark outer bark is scraped off being careful to remove it all but not to scrape into the thin orange cinnamon layer. A paint scraper worked well for this. Initially, the cinnamon may appear yellow, but after exposed to the air for awhile, it will be more orange. Next the branch is firmly rubbed all over to loosen the cinnamon layer from the wood. We just used a short piece of wood to rub the cinnamon layer but in Ceylon they apparently use a special tool, a brass rod. It was mentioned that you shouldn't use any other type metal for the rubbing as it can darken the cinnamon. A long lengthwise cut is made through the cinnamon layer with a sharp stainless steel knife and one or more cuts are scored around the circumference of the branch, depending upon the section length you feel comfortable working with. Ceylon professionals cut the entire length of 1-2 meter branches into one piece of cinnamon, but being beginners, and not having long straight twigless branches like they grow specifically for this purpose, we had better luck sectioning the cinnamon into about 4-5 inch cinnamon stick-sized pieces. 'Knots' from side branches make it more difficult to remove the cinnamon in large sections. After scoring the sections, begin to carefully pry up the cinnamon layer in as big a piece as you can with a knife or metal spatula. With practice, you'll be able to remove most sections in one piece. The cinnamon will quickly start curling up into a cinnamon stick as it dries. A few pieces can be rolled together or a big piece can be filled with the smaller scraps of cinnamon to make cinnamon sticks. The sticks needs to thoroughly dry in the shade for about a week. Sun will leach out the flavor. I also put the cinnamon sticks in a barely warm, turned off oven to help them along since we have such high humidity here. Wow! Did my kitchen smell good! After it was dried, I ground some cinnamon in a coffee grinder. I had to do it several times to get all the chunks out, but eventually I ended up with a jar of finely ground cinnamon. I put the rest of the sticks in a glass jar. I use the sticks for cinnamon tea, a new favorite of mine. It's a lot easier to show than tell, so here is a video that our part time garden helper Ever helped me to make. He did a great job explaining. Watch my video on YouTube if it is not showing above. This turned into quite a popular project, with some neighborhood kids coming to learn how and Yamileth, my housekeeper, getting enthused about helping, too. She told me that her neighborhood pulperia charges three lempiras for a very tiny piece of canela about two inches long. The boys told me their mom was going to make arroz con leche (rice with milk, sort of a rice pudding) with some of their cinnamon. We all have enough cinnamon to last a long time. The boys have since come back to get some of the seedlings to try to grow their own cinnamon trees. This was also a very 'green' project. We accomplished trimming the tree, used the small twigs and leaves in the compost, harvested enough cinnamon for workers and friends, and gave the left over wood to a poor man who sells leña (firewood) to those who still cook with wood stoves. No waste at all. Soaking the branches might have removed some of the cinnamon flavor. The soaking water certainly turned into cinnamon tea. But my sister-in-law says that it takes much less of our cinnamon to make tea than it does the cinnamon she's bought in La Ceiba before, so I'm not sure. We have some more trimming to do where the tree is hanging over the fence but I'm going to wait until after rainy season next spring as recommended. It will be interesting to see if the flavor is any different next time. This cinnamon is very sweet and mild, which was really good in iced coffee and made a great flavored cinnamon ice cream. I've used it in cinnamon bread, cookies, and a few other recipes. I used a little more than I do with store bought cinnamon, which has a harsher flavor. Besides a cooking spice, cinnamon tea has been used in home remedies for thousands of years but has recently become very popular as a means to aid weight loss, blood sugar control, stomach upsets, and other health concerns. Scientific studies sometimes disagree, but users swear by it. Less expensive Cassia cinnamon is more often found in US grocery stores, though you can get Ceylon cinnamon (true cinnamon) in specialty stores and online. Cassia is stronger flavored and is considered a less desirable cinnamon. Some people even consider it unhealthy because it has much higher levels of coumarin, which can cause liver damage. Ground cinnamon will generally be labeled as to the type but other ways you can tell which type you have is that Ceylon cinnamon is lighter colored, more of a golden or oranish brown, while Cassia cinnamon is dark, reddish brown. In stick form, Cassia is much thicker and the stick usually consists of one layer, hollow inside. Ceylon sticks may consist of several thinner layers or small pieces rolled up inside like a cigar. You can break the Ceylon cinnamon sticks and cannot break the Cassia. 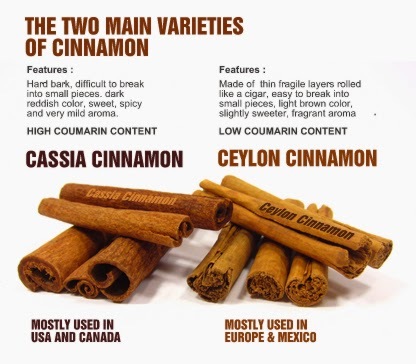 80% of the world's Ceylon cinnamon still comes from Sri Lanka, formerly called Ceylon. Indonesian, Vietnamese, and Chinese cinnamon are all forms of the cheaper Cassia cinnamon. If you buy a tree, make sure that you get true cinnamon, Cinnamomum zeylanicum. 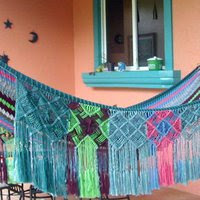 I believe it is still sold at CURLA here in La Ceiba. You might consider buying two, one for growing a shade tree and one for harvesting the spice. That way you can have the best of both worlds: a beautiful shade tree and your own small cinnamon plantation. To see how Ceylon professionals harvest cinnamon, check out this beautiful video, The Cinnamon Story. They are amazing! This man was getting cinnamon pieces at least 1-2 meters long. In the last part of this video, they are making cinnamon oil. There is no 'cooking' involved in harvesting the spice, though drying ovens or rooms are used to speed the drying process on cinnamon plantations. For everything you ever wanted to know about cinnamon, check out Cinnamon Vogue. Someone just posted a comment on an old article about typical Honduran food and skimming through the comments, I ran across this old exchange that made me laugh (again). this isn't helping me at all!!!!! i Hate this website!!!!!! Why doesn't it help?!!!!! Do you have a homework assignment?!!!!! i cant find what im looking for... and yeesss i have a homework assignment due Tomorrow!!!!!!!!!!!!!!! bllaaaahh!!!!!!!! Should have started earlier like your mom always says!!!!!!!!!!!!!!!!!!!!! What do you need? Unfortunately, Anonymous Nina didn't reply so I don't know what she was looking for. I would have tried to help her! I just couldn't resist giving her a little bit of a hard time. If her question was about typical Honduran food, it was a shame that she didn't take the time to read through the 60 comments in which many Hondurans offered their insights about many other typical foods that I didn't include in the article. I think it is time to expand on that article! For a very good blog written by a Catracha with lots of Honduran recipes, most of which are in both Spanish and English, check out Cocina Hondureña y Mas.